Set up, focus and align your scope with an EP as usual. Slew to a bright star and center it in the EP. Replace the EP with the camera using a C-Mount adapter or focal reducer and re-balance the scope. Attach the power cable and video cable to the back of the camera. If the camera has both S-Video and Composite video connections, you can use whichever you prefer. You can even use both and display the image on two monitors. If using a hand remote to control the camera, attach it to the remote control connector, "Auto-Iris" or "Aux", as shown in your camera manual. Provide strain relief for the cables so that they do not come loose or cause problems with mount tracking. 6. Attach the other end of the video cable to the composite video input (or S-Video input if appropriate) of the monitor. Many TVs and LCDs no longer have S-Video inputs, but in that case you can use the Composite video input. Composite video connections are color coded yellow. Many recent LCD TVs use one of the Component video inputs as a Composite video input - again it will be color coded yellow. This input require an RCA video connector. So if your cable has a BNC bayonet type connector on both ends you will need a BNC to RCA adapter which should cost less than $2 and is widely available on-line or at your local Radio Shack or electronics store. to know how to do this. These settings will provide high sensitivity and a fast response which are best for focusing. 9. 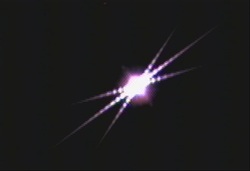 If the star was properly centered, you should see an out-of-focus star on the monitor. You can adjust the focus knob and watch the image change on the monitor. If the image gets larger, turn the focus knob the other way. A Bahtinov mask is very helpful to get a good focus. Just center the line within the "X" pattern as shown in the picture at left. If you cannot reach focus turning the knob fully in either direction, you may need an extension tube to move the camera further out if you are using a refractor or SCT. For some Newtonians, you may not be able to get the camera close enough to the primary mirror to reach focus. The possible solutions for this are: 1) Use a low profile focuser; 2) Use one of the smaller format cameras which can fit inside a 2" focuser, but be careful it doesn't fall into the secondary mirror; 3) Modify the telescope so that you can move the primary mirror closer to the secondary. 10. Once focused, remove the Bahtinov mask if one is used and slew to a deep sky object of interest. Leave the Gain on high, Gamma on Low and increase the exposure to about 20 seconds. These settings are to help you confirm that the object of interest is centered in the field of view. If not, center it. If it is not visible at all, you may have to do a search by moving the telescope around the general area. The larger the focal length of your system, the more difficult it may be to find and center the object unless your GoTo alignment is very good. Deep sky video is usually performed at a focal ratio of f/5 or lower to give a wider FOV and shorter exposure requirements. When using a camera with internal frame averaging (3D-DNR or Intermul) such as all of the cameras from AVS, the Lntech 300 and the Mallincam Micro and Super there are two options: 1) Use the frame averaging to reduce image noise but wait longer to see the final image; 2) Do not use frame averaging and get a faster, but much nosier image. My preference is the first, so I will describe a suggested procedure for that here. Set 3D-DNR to the maximum, 5. This will result in the camera internally averaging 5 frames for a better image. AGC must be on for 3D-DNR to work. 3D-DNR greatly reduces noise and provides a more detailed image at the cost of a longer wait time for the final image to appear. With 3D-DNR set to 5 and the exposure set to 1024X, it will take 5 x 17sec = 85sec for the camera to complete the averaging process, assuming it is an NTSC camera. For a PAL camera it would take 5 x 20sec = 100sec. The image will slowly improve at 17sec intervals until it reaches 85sec. Also, set Gamma to High (1) to minimize the brightness of the background. If the object is overexposed, turn down the exposure. If it is still under exposed lower the Gamma. You should experiment with different values of AGC, exposure and Gamma. On many cameras, AGC will cause amp glow which is a brightening of the background in the upper left hand corner or top center of the image. This is caused by noise from the readout amplifier picked up by the CCD. Some cameras, like those from AVS have been modified to eliminate amp glow. Lower Gamma values stretch the image grey scale. Longer exposures bring out more detail but require better tracking capability. When using a camera without internal stacking, I like to try not to use AGC to avoid the background noise from amp glow. I prefer to use longer exposures because my mounts will usually support them. And, sometimes I do autoguiding to get excellent long exposure tracking. Also, I like to set Gamma to 1 to avoid washing out the background. Both of these work extremely well at dark sites. However, from my backyard I often have to lower Gamma and sometimes turn on AGC, but usually only to the mid-point. You will also want to make adjustments to the Brightness and Contrast settings on your monitor to get the best possible image. There is a lot of help available on the various Yahoo Groups for both Mallincam and AVS, as well as, on the Cloudy Nights EAA forum.